Lantek and GRAITEC are collaborating to integrate their solutions for the sheet metal manufacturing sector. This new partnership will allow both companies to expand and consolidate their business in new markets. Lantek, a global leader in the development and sales of CAD/CAM/MES/ERP software solutions for the metal industry, is seeking to develop its extended technical and innovative program with the announcement of the signing of a collaborative agreement with GRAITEC. The joint aim of the companies is to offer clients in the sheet metal manufacturing sector one single integrated solution to satisfy their requirements. Thus, this partnership signifies the start of a professional relationship for the two companies, enabling them to consolidate their position in the sheet metal and steel construction industry on an international level. GRAITEC, a company of French origin, is a pioneer in the development and sale of software dedicated to structural construction design and engineering. With more than 25 years of experience on this market, it has 12 branch offices dotted around Europe, North America and Asia-Pacific, with a team of 260 employees and more than 40,000 users worldwide. With a turnover of more than 25 million Euros in 2011, GRAITEC is currently the only supplier able to offer a complete and integrated range of design and structural analysis solutions for the steel, concrete, and wood construction industry. GRAITEC has an innovative BIM (Building Information Modelling) technology, which inevitably increases productivity and safety thanks to the automation, integrated design, and control processes. Due to its capacity to exchange data in an intelligent way, GRAITEC Structural BIM Solution simplifies and makes more flexible the collaboration between professionals in construction design, the engineers, and professionals in the construction sector, while facilitating a more sound, intelligent and fluid communication. As a result of this collaborative agreement, the two companies are working on a bi-directional integration process, GRAITEC Advance BIM. 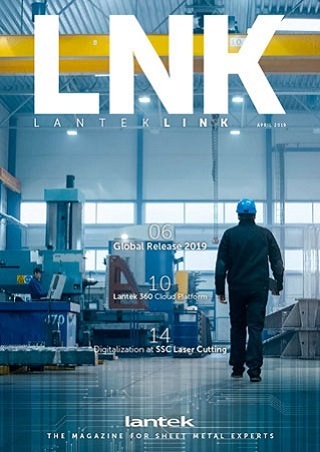 This process will bring together the technologies of both companies by connecting the models realized on Advance Steel to the Lantek Steelworks solution. In this way, a metal structure project may be managed on Lantek’s part; and, its progress may be exchanged with Advance Steel, which shall provide users with a flexible and simple architecture to manage. This can result in a more powerful and rapid solution, which offers the option of generating and managing structural project information more dynamically, substantially reducing the time and resources spent on design and construction. Additionally, this partnership envisages the definition, establishment, and coordination of collaborative rules and provides support within the innovation area, as well as installation of the technical and human resources required on the part of the two companies, so that it does not impact development. In parallel, Lantek has implemented a training program for GRAITEC’s Advance Steel solution and API communication in order to train its technical team and to give it the means to manage the integration project of these systems. Moreover, and at the root of this association, the two companies shall have the opportunity to tap into new fast-emerging markets in addition to increasing their presence in other countries such as the United Arab Emirates and Asia for GRAITEC, and Canada, Romania, and Eastern Europe for Lantek. Lantek is a leading global multinational regarding the development and commercialization of software solutions for the metal industry and the machine tool sector. Its capacity for innovation and its firm commitment to internationalization and emerging markets have led Lantek, founded in 1986 in the Basque Country and with central offices in Vitoria (Alava), to devise a global-local strategy, which has meant it has become a global reference within the industry with its CAD/CAM/MES/ERP solutions. Today, the company has over 12,000 customers in over 100 countries and its own offices in 15 countries, in addition to an extensive network of distributors that are present throughout the world. In 2011 its international operations provided 83% of its turnover.